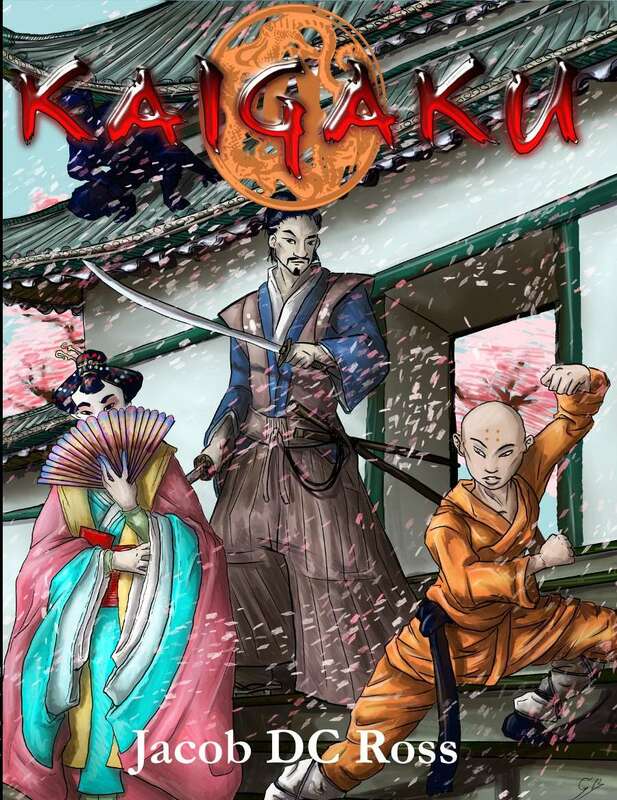 Published by Thunderegg Games following a successful Kickstarter campaign, Kaigaku is a roleplaying game which uses the mechanics of The Black Hack to present an ahistorical take upon a feudal Japanese style setting. This is the Empire of Kaigaku, a giant peninsula ruled by alternating emperors—Hidari no Daiten in the West, Migi no Daiten in the East. The lands are administered in his name by eight clans over the farmers, artisans, merchants, and untouchables. These are the Atsumichi or ‘Iron Flowers’, the founders of the imperial court; the Chisaten or ‘Lesser Imperials’, those of the Imperial house who do not ascend to the throne; the Kakujima or ‘Wily Traders’, island merchants who have maintained their independence; the Kondo or ‘Forest Wardens’, who remain isolated in their woodland home; the Morimoto or ‘Snakes’, manipulative sailors who maintain good relations with Southern gaijin; the Shirai or ‘Keepers of Wisdom’, scholars and Imperial archivists; the Toguchi or ‘Hidden Blade’, fabled duelists and vitriolic demagogues; and the Watanabe, the ‘Vigilant Sentries’ who stand guard on the great western wall against invasion by foreigners. Kaigaku is rent by internal strife as the clans feud with each other for power and influence over both the current and the next Emperor. Each of the eight clans has its own Bushi who come together in great clashes on the battlefield or great duels of honour; Courtiers who engage in matters of etiquette and politics at court; Ninja who spy and strike from hiding; and Ascetics who learn aid others and study the Kiseki, the stones which fall from the sky and which give great power. All though, must contend with the Gaijin who sailed from faraway empires to trade with Kaigaku and those who live nearby. They include the Albar, wily traders and excellent sailors; the Cordova, religious zealots; the Kherin, horse lords and raiders from beyond the Western Wall; and the mysterious Uriwane. Of these, the Albar and the Cordova have brought with them gunpowder, which the clans willingly purchase to get the edge over their rivals. The Gaijin strictly control the sale of the black powder whilst none of the clans have been able to replicate it or the weapons that use it. This all roughly analogous with the Japan of the late sixteenth and early seventeenth centuries, roughly when the Portuguese and the Dutch were in contact with the island during the Shogunate. Indeed, the Albar and the Cordova can be seen as the equivalent of the Dutch and the Portuguese. In the Empire of Kaigaku though, there is no Shogun, only alternating emperors. Kaigaku is a Class and Level roleplaying game, which using The Black Hack mechanics, is ultimately derived from the d20 System. The mechanics are player-facing in that a player makes the rolls rather than the Game Master, so as well as rolling for his character to hit a target, a player rolls for his character to avoid being hit by his opponent. These rolls are typically made against a character’s attributes, so against Strength to make and avoid a melee attack roll, Wisdom to spot an ambush, Intelligence to win a game of Go, and so on. 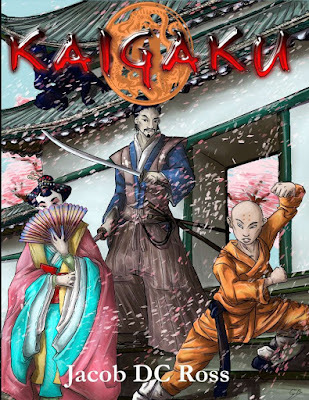 Unlike other Old School Renaissance retroclones, Kaigaku does not use Armour Class, but armour points, and uses the Advantage and Disadvantage mechanics of Dungeons & Dragons, Fifth Edition—two twenty-sided dice are rolled and the best used if a character has the Advantage, or the worst used if the character is at a Disadvantage. Kaigaku also adds a few tweaks of its own. One is Intensification. By reducing the target a player has to roll for his character by two for each level of Intensification, the amount of damage a character can do in combat is increased, the more impressive the action being rolled for turns out to be. The maximum level of Intensification a player can select is equal to the character’s Ryu tier level. Much of a character’s actions in the game will focus on rolls to check whether they are at Advantage or Disadvantage, for example in mass combat, in duelling, and so on, and the level of Intensification his player wants to apply. Another is in duels when both participants center themselves with rolls against Wisdom or Intelligence in order to see whether they are have at Advantage or Disadvantage in the subsequent strike. A third is the use of Honour, which enables a character to act with Advantage when invoked, but at a Disadvantage when acting dishonourably. One element common to fantasy interpretations of feudal Japan is some kind of magic. Kaigaku does not have magic, although there is a supernatural element which is just hinted at in the rulebook, so no spellcasters, whether sorcerers or priests. Instead it has Kiseki. These are gems, jewels, and precious stones infused with elemental power—Air, Earth, Fire, Water, and Void—which fall from the sky in great meteorite strikes known as seirakka and can harvested to be worked into the great arms and armour and other items to have impressive effects or implanted in the bodies of Ascetics for command over the elements. The downside is that the seirakka can send the local fauna mad and if an Ascetic implants too many, he too may be driven mad by the Kiseki. Creating a character is a matter of rolling dice to determine the values for his six attributes—Strength, Dexterity, Constitution, Intelligence, Wisdom, and Charisma—and selecting a Class, a Clan, and a Ryu (or school). The four Classes are Ascetics, Bushi, Courtiers, and Ninja, and each of the eight Clans has a Ryu or school for each of the four Classes. A Class determines a character’s Hit Points, arms and armour use, standard attack damage, a special feature or two, and starting equipment. Choice of Clan provides a character with some general background, but primarily dictates which Ryu the character will train in depending upon their Class. Each Ryu grants five abilities ranked into five Tiers. A character receives three skills. One for his Station or upbringing, one for his Passion or hobby, and one for Duty or job. One of these begins at +2, the other two at +1. In play they add to a character’s attributes and will rise in value as a character rises in Level and Tier. Advantage when playing Go (Wisdom or Intelligence check). Intensify on the roll to inflict a penalty on opponent’s Go roll. Physically, Kaigaku is underwhelming. The full colour layout is clean and tidy, but the artwork tends towards a cartoon style and is pedestrian rather inspiring. Worse though, is the cartography which is so bland as to represent something that the Gaijin might know rather than the natives of the empire. The single map of Kaigaku might as been a blank page for all it serves the setting, forcing the Game Master to draw her own. Now the first issue with Kaigaku is the opening sentence on the back cover blurb which states, “Kaigaku brings dramatic samurai action to your tabletop!” This is quite simply marketing hyperbole—or twaddle, because fundamentally, ‘dramatic samurai action’ never went away from your tabletop. There are roleplaying games which offered this before Kaigaku was published and after… What the author should have written is something like “Kaigaku brings dramatic samurai action to the Old School Renaissance!” and that would have been more accurate. The second issue is with another sentence on the back cover blurb with states, “This book presents you with a fully fleshed-out game setting that’s detailed enough to jumpstart your imagination, but light enough so you can make stories that you want to tell.” The second part of this sentence is true exactly because the first part of the sentence is not true. In no way, shape, or form can Kaigaku be described as a “fleshed-out game setting”. In fact, Kaigaku is incomplete. There are no monsters or beasts given; there are details of the foreigners or Gaijin either, despite their being constantly mentioned throughout the book; there is no history, not even a list of major events, and deliberately do so that the Game Master can write her own; and lastly, there is no geography, the map of Kaigaku being so bland and boring in its lack of detail that again, the Game Master would better off drawing her own. Arguably Kaigaku should not have come with a map just as it does not come with a history so that the Game Master can write and/or draw her own. And yet, Kaigaku is a mechanically sound roleplaying game for anyone wanting a retroclone with samurai and ninja. Indeed, it is actually far superior to the woefully underwritten Ruins & Ronin [http://rlyehreviews.blogspot.com/2011/03/west-is-still-best.html]. Certainly, The Black Hack is a more than serviceable set of mechanics and just as it works in standard fantasy roleplaying, it works in samurai fantasy too. The design of the Classes are decent too and so are the mechanics new to The Black Hack core rules. And therein lies Kaigaku’s real problem. For as playable as Kaigaku is, it looks and feels familiar to another Asian fantasy roleplaying game, Legend of the Five Rings. Now of course, when writing a roleplaying game based on feudal Japan there are going to be similarities between it and any other roleplaying game based on feudal Japan. There will be samurai, courtiers, and ninja, there be an emperor, and possibly, there will be Gaijin. Given that Kaigaku is an Asian fantasy roleplaying game, it mixes in China too so that there is a wall which protects the empire from dangerous foreigners looking to invade. So far, so expected. But compare the new mechanics of Kaigaku with Legend of the Five Rings and the Intensification mechanic looks similar to making Raises in Legend of the Five Rings. In the latter roleplaying game, a player or the Game Master raises the target number the player has to beat in order to have his character do something with style or with greater accomplishment or overcome a greater challenge. For example, a player may only have to beat a target number of twenty for his character to strike a bandit, but if the player wanted his character to hit with more damage, then he might would raise the target number to twenty-five, thirty, or more, depending upon the number of damage dice the player wanted to roll. In Kaigaku, a player is doing the reverse, that is, lowering the Target Number, by a factor of two for each degree of Intensification, for exactly the same aims. Similarly, the use of the elements in Kaigaku, are not the traditional five of Shintoism, Yin and Yang philosophy, and Daosim—Wood, Fire, Earth, Metal, and Water—as used in other roleplaying games set in ancient Asia, such as Cubicle Seven Entertainment’s Qin: The Warring States, but Air, Earth, Fire, Water, and Void. And Air, Earth, Fire, Water, and Void are the elements intrinsic to Legend of the Five Rings. Indeed, they are the five rings of the game’s title. Now in Kaigaku, they do not play as prominent a part, but they are present and one of the Ascetic Ryu, the Heavenly Fist of the Shirai clan, actually trains in their use to make elemental strikes with them. Now it is obvious that there is more detail to the techniques of Legend of the Five Rings, but within all that detail, there is content that is similar to that of Kaigaku. Perhaps some of the similarities between Kaigaku and Legend of the Five Rings are due to the author having contributed to the supplements Enemies of the Empire, Strongholds of the Empire, and The Great Clans, and therefore knows the fourth edition of Legend of the Five Rings. Given that degree of familiarity, the degree of similarity between Kaigaku and Legend of the Five Rings are undoubtedly striking. What can be drawn from that is another matter. The opening of the author’s introduction reads, “Kaigaku was a long time coming. I wanted to make a game system that captured the feel of other samurai RPGs without being a simple copy.” Which of course is not only a laudable aim, but exactly what you would expect from the design of a roleplaying game. Yet it does not feel as if the author has avoided Kaigaku “being a simple copy.” Rather it feels as if the inspiration of another game weighed too heavily upon the author when it came to designing his own game. Dungeons & Dragons & Glorantha?